If you are a man or the unicorns that have never experienced Premenstrual syndrome (PMS), stop rolling your eyes. Yes, PMS can be a big deal. It can make women feel uncomfortable (to put it lightly). And it can make the people around the PMSing woman run for the hills. Seriously, I know husbands that escape to go camping or urgently need to work weekends when their wives are PMSing. Even the females experiencing PMS admit they do not want to be around themselves. PMS is not going to kill you (and hopefully not the people around you). It is not a disease, and it is not contagious. If a woman is brave enough to bring up PMS with her doctor, they are going to get blown off. Most doctors do not give PMS much credence. If they remotely try to treat it, all you get is birth control pills, antidepressants, and even a hysterectomy. A perfect example is my patient, “Kara”. Kara came to see me for “hormonal issues”. Her husband, “Kevin”, came in with her because they were not only concerned about her symptoms but also how it was affecting their marriage and family life. This is not unusual to have a couple come to the appointment together. As mentioned above, PMS is not a disease, but it can truly affect relationships and quality of life. Kara said her doctor put her on birth control pills and an antidepressant. Both of which she could not tolerate. Then she was told she could possibly be bipolar and needed to see a psychiatrist. Both Kara and Kevin really thought it was her hormones because the behavior and symptoms were cyclical. During her period, although it was really heavy, she felt great. Then the week after her period, Kara felt pretty good. Starting day 14 of her cycle, she felt poorly and continued to feel worse until she got her next period. Her main symptoms were the mood. Kara said she wasn’t depressed. But she was so mean and they both described it as rage. Kara would get mad at everything. She said everything bothered her. She would fight with Kevin and yell at her kids for being messy. Then cry because she felt guilty at her behavior. She did not have a libido at all during this time. Not that Kevin was interested, because she was so irritable. Her cravings for sugar were intense the two weeks before her period. Every month Kara would gain 3-5 lbs during her PMS-time and then try really hard the first two weeks of her cycle to try to lose it. I told them, there is not a magic pill that is going to make this better. It was going to consist of a multifactorial treatment plan that she is going to have to stick to. Below are some tips that Kara still does to this day to control her PMS symptoms. 1. Imbalance between estrogen and progesterone: We all know women get periods. We get periods because our estrogen and progesterone are cycling in a 28-day cycle. Every day is different for our hormone levels. During your period, day 1-4, your estrogen and progesterone are very low. From day 5 to day 11 your estrogen will start to rise, spiking to a high level on day 12. The elevated spike in estrogen on day 12 will signal the egg to be released from the ovary hence, ovulation. When the egg leaves the ovary (ovulation), it leaves behind what is called the corpus luteum. The corpus luteum will start to secrete progesterone. Ovulation usually occurs on day 14 of a 28-day cycle. From day 14 (ovulation) the progesterone will begin to rise. Day21 is the highest level of progesterone in your body. From day 21 the progesterone will start to reduce until day 28 when you have a period. 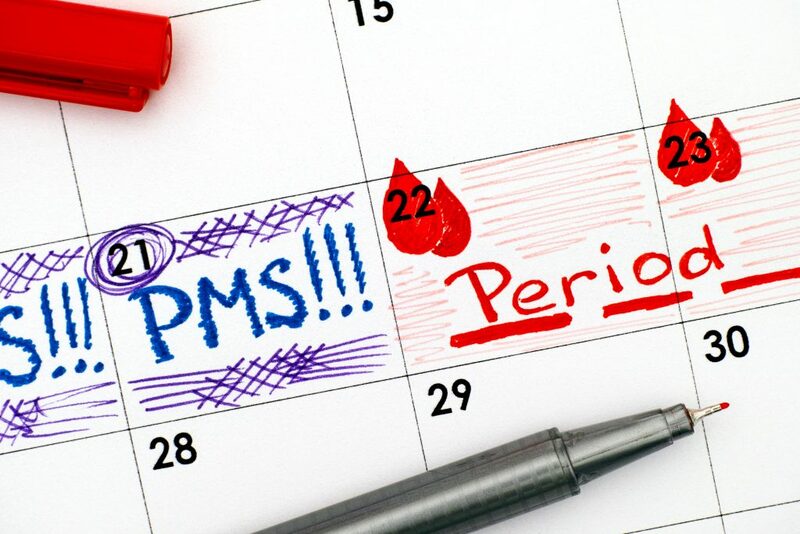 It is during this process of hormonal changes in a 28-day cycle that creates symptoms of PMS. It is the levels of progesterone from day 14 to 28 that can cause PMS. Sometimes the progesterone is not released high enough starting day 14. In this case, a woman will have PMS symptoms beginning on day 14 to her period. This means she has PMS for 14 days of the month. Which let me clarify, she will feel crummy (and everyone around her), for half of the month. Feeling awful for 50% of her life, that is not a way to live a happy, productive life. Others the progesterone plummets from day 21 to day 28, so they will have PMS symptoms the week before their period. Progesterone: Do not take non-bioidentical progesterone, progestins. I know you might be desperate to fix your PMS, but these medications are not healthy. You can raise your progesterone by taking bioidentical progesterone. Micronized bioidentical progesterone is entirely 180 degrees different from progestins. Any doctor that tells you otherwise is a signal that you need to find a new doctor that stays up with the latest research (random google posts do not count). To determine if your PMS is from low progesterone, you need to take a test. There are blood, urine, saliva, etc. testing available for progesterone. Make sure you see a doctor that knows the interpretation of these tests. And make sure to do to do your test on day 17 to day 25 (ideally day 21) of your cycle. If your progesterone is low, you can take progesterone to raise your levels and eliminate your PMS symptoms. Why do I have low progesterone in the first place? This is a valid question. But that is for another very longish post later. Vitex: Maybe you cannot take progesterone, or you are not a good candidate (your experienced doctor will know for sure). You can take vitex (chaste tree berry is the common name) to help with low progesterone. Vitex can help upregulate your own progesterone levels without actually taking progesterone. On a more physiological note, vitex raises LH (luteinizing hormone) which in turn will raise progesterone in women and testosterone in men. Evening primrose oil: EPO is great to women for all ages. I use EPO a lot for teens. Because we all know, being a teen is akin to being a hormonal mess. Evening primrose oil can help balance hormones without actually giving someone hormones. Not to mention, it is great for your hair. Estrogen-Dominance: Mentioned above, low progesterone can cause PMS. When you have low progesterone, means your estrogen is unopposed (AKA estrogen running the show). Yes, low progesterone will create Estrogen-Dominance. In some women, you can have the best progesterone, but the estrogen is too high. When your body produces high levels of estrogen, that also makes you Estrogen-Dominant. High levels of estrogen can cause extreme PMS. The goal here is to reduce estrogen levels. Specifically, reduce estrogen metabolites such as 2OH-estrone and 4OH-estrone. You can do this by taking DIM. DIM is derived from indole-3-carbinol which comes from cruciferous vegetables like broccoli and cabbage. It helps to reduce the “bad” estrogen metabolites. DIM is also helpful in preventing growth of fibroids. Make sure you get a quality product and effective dose of DIM. Why is my estrogen so high? Well that again is another long-ish post later. Ground Flaxseed: I am not talking about flaxseed oil, but the seeds. When you ground the flaxseed, it releases the lignans which are helpful for balancing hormones. The cool part is, it balances hormones without giving someone hormones. Keep the ground flaxseed in the freezer to keep it from turning rancid. Try to use about three tablespoons a day. It has a nutty flavor so you can sprinkle it on salads, soups, oatmeal, yogurt. Or you can put it in water mix and slurp it down. And it is an excellent source of fiber for your digestion. PMS-anxiety: One common symptom of PMS is anxiety. Either trigger for anxiety are worse, or there is a low level of anxiety present during times of PMS. L-theanine is an excellent amino acid to help with anxiety. It is non-habit forming and does not reduce performance. You can take it as often as needed for angst. I use it with patients of all ages. 2. Improve Liver Function: Your liver is a powerful organ that detoxifies everything in our bodies. If it is not functioning as well because it is burdened with too many toxins, then it cannot metabolize the estrogen as well. This can cause Estrogen-Dominance creating symptoms of PMS. If you have a fatty liver, that means your liver is not functioning as well as it could. If you have elevated liver enzymes, that too means your liver is not processing efficiently. Reduce alcohol consumption: Your liver works hard to metabolize alcohol, By reducing or removing alcohol, that can take the burden off your liver. Minimize or eliminate caffeine intake: Like alcohol, caffeine can be hard on your liver. So while it is distracted trying to metabolize caffeine, your liver cannot do a proper job metabolizing hormones. Digestion: If your digestion is impaired that can put a burden on your liver. For example, being constipated can cause extra work for your liver, making it less efficient. Also if you are not digesting your food properly, can also put more work on the liver (not to mention the immune system). If you are having constipation, taking magnesium and a good probiotic can help. And if you notice any undigested food particles in your stool, take a digestive enzyme with your meals. Liver Support Supplement: There are lots of supplements for your liver on the market these days. Taking a supplement that is high in beneficial nutrient for your liver can help it work better. A good supplement is one that has turmeric, N-acetyl L cysteine, alpha lipoic acid, milk thistle, artichoke, L-glutamine, L-methionine, taurine to name a few. 3. Balance blood sugar and insulin: Eating foods that have a high glycemic index will cause your insulin to skyrocket. Eating an abundant amount of processed, refined carbohydrate will exacerbate PMS symptoms. These foods are not good for your liver and digestion thereby really increasing PMS symptoms. Not to mention, insulin is fat storing. Eating foods that spike your blood sugar and insulin will also cause rapid weight gain, especially in the stomach area. 4. Check your thyroid: Make sure to optimize your thyroid levels. Normal thyroid levels are not good enough. You want spectacular thyroid levels. If the thyroid levels are on the low end of normal, that can exacerbate PMS symptoms. Thyroid levels can help balance estrogen. Like I had mentioned above, Estrogen-Dominance can impact PMS. When thyroid levels are not optimal, then estrogen takes over. The thyroid helps to rein in the negative effects of estrogen such as PMS. To find out if you have optimal thyroid levels, make sure to test your TSH, Free T4, and Free T3. For a full explanation of thyroid testing and optimal levels here is a link to our podcast. In this post, we go into full detail on comprehensive thyroid testing and optimal ranges. 5. Body fat, belly fat: Did you know that your fat cells secrete hormones? While most people want to lose weight to fit better in their clothes or improve their health, they do not realize that by losing weight can help PMS symptoms. Adipose cells (fat cells) secrete estrone which is estrogen. We make three estrogens, estrone, estradiol, and estriol. If our fat cells are making estrone on top of the estrogen that we are making from our ovaries, that creates Estrogen-Dominant. Yes, it can be hard to lose weight. With Estrogen-Dominance, that too makes losing weight difficult. Later in the post, I will get into the solution for belly fat and weight loss. 6. Reduce Stress: Stress raises cortisol. It does this by a term called: Pregnenolone-Steal. Pregnenolone is a hormone that mainly comes from the adrenal glands. It is helpful for memory, learning and is neuroprotective. Pregnenolone also supports progesterone levels. The snafu here is when stress is elevated, pregnenolone is shunted away from progesterone to cortisol. Cortisol will rise, and progesterone will drop, which will cause PMS symptoms. Cortisol also causes a breakdown of our muscle protein to raise glucose levels. The rise in glucose will cause insulin to rise. Thereby causing weight gain. So being stressed out can make you fat and have PMS. I know trying to reduce stress can be hard in our lives, so do your best to balance stress. You can also minimize cortisol by reducing physical stressors on your body. Engaging in a high volume of intense cardiovascular exercise will raise your cortisol. To reduce cortisol, do more weight lifting and walking. 7. Get More Sleep: Getting enough (7-8 hours) restful sleep is beneficial for PMS. If you are not sleeping enough, that can cause the cortisol to rise, reducing progesterone (see above: Pregnenolone Steal). I have many people that complain they cannot fall asleep and/or stay asleep. Here are some tips to help with sleep. Melatonin: This can be helpful for falling asleep. Use the instant release versions as the sustained release has a tendency for grogginess in the morning. Some people cannot tolerate melatonin at all. Saying it causes morning fatigue or intense, vivid dreams. In that case, drinking unsweetened tart cherry juice can help. As cherry juice is a good source for natural melatonin. Have a small bedtime snack: Having a little snack of protein and fat before bed can help balance your blood sugar while you are sleeping. Often our blood sugar can drop in the middle of the night. Your body’s response is to make cortisol, which then wakes us up. If you have a little something to eat before bed can help prevent waking up in the middle of the night. Turn off light devices two hours before bed: Light tricks your body into thinking it is daytime. That will automatically raise cortisol causing trouble falling asleep. For a more in-depth guide to sleep, see our other article: 11 Tips on How to Improve Sleep with Adrenal Fatigue. We created a guide to called the Keto-Carb-Cycling-Program, and it’s a free download. Initially, we designed it to help with belly fat, but it also helps PMS symptoms as well. It is a program that will help reduce insulin and cortisol to help with weight loss. By targeting weight loss, it will reduce excess amounts of estrone produced by fat cells. By reducing cortisol, it helps with sleep and balances pregnenolone and progesterone levels. Thereby, helping to remove Estrogen-Dominance. The KCCP will also improve liver function by eliminating the processed inflammatory foods and decreasing the insulin levels. Improving your liver function will also help clear our estrogen metabolites and improve PMS symptoms.